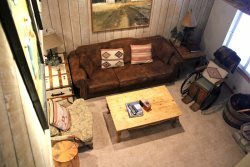 Nice One Bedroom & Loft & Two Bath, Pet Friendly Condominium in the Scenic Meadow Area of Mammoth Lakes. Sleeps up to 6 (approx. 1100 sq. Ft.). This spacious 2 story unit has vaulted ceilings and you walk up one flight of outside stairs to enter the unit. Corner unit is bright with lots of windows to let the light in and has a very good view. The first floor is the Bedroom, Kitchen, Dining Room, Living Room and 1 Full Bathroom. The second floor is the Loft and the 2nd Full Bathroom. The Loft is open to the Living Room by a half wall. The Master Bedroom has 1 Queen Bed and 1 Twin Roll-a-way bed, the Loft has 1 Twin Bed & 1 set of Bunk Beds with a Full on the bottom and a Twin on the top, and the Living Room has 1 Queen Foldout Couch. There are 2 Flat Screen TVs (Living Room and Bedroom) as well as 2 VCRs, 1 DVD Radio/CD players in the unit. No land line phone in unit. Wireless Internet Access. Unit Painted October 2013. There are two outside parking spaces available. Sunrise offers a Spa, Seasonal Swimming Pool and Sauna. Coin-operated laundry facilities located in the common area near the office. COMPLIMENTARY INTERNET and CABLE TV are provided, however NO REFUNDS will be given for connectivity problems or Internet failure. TOT LICENSE 807-SR51. We enjoyed our stay in Mammoth, thank you. As always its a very good experience our interactions with all at Central Reservations. Thank you again. The weather was interesting. Summer and winter all in a few days! Straight forward and easy check in/out All rules and amenities laid out very clearly Great place, great location. Hi, we had a great stay in unit 51 at Sunrise (over Thanksgiving), we love staying there! We really enjoyed again this unit and thank you for your help in setting this up.